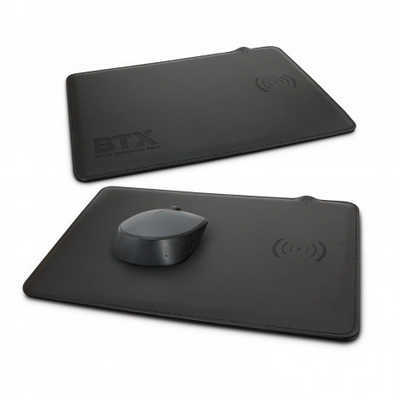 Futuristic mouse mat with a built in 5 Watt wireless phone charger. It is compatible with devices that are enabled for QI wireless charging and will charge most modern phones including iPhone 8 upwards, Samsung Galaxy S6 upwards and many more. Simply plug it into a USB port or a mains adapter and place a compatible device on it for convenient wireless charging. Davros is manufactured from PU with smart black stitching. It is supplied with a Micro-B USB cable and an instruction leaflet. Colours: Black. Dimension: W 288mm x H 212mm x 4mm. Print Description: 55mm x 55mm. Print Type: Pad Print. Packing: Individual box. Price includes : 1 Col 1 Pos Print. Setup is included.